Back in April Twitter teamed up with The Iconfactory to launch a set of 872 Twitter emoji icons for the web. Previously emoji was only supported on Twitter apps with the characters built-in, so this allowed for a much-improved experience across the internet. On Thursday Twitter released all of their emoji as an open source library, accessible to the developer community around the world. Emojis originated in Japan and the term translates literally as “picture character”. Since we’ve gotten many requests to use our emoji in various projects, as of today we’re open sourcing our emoji. 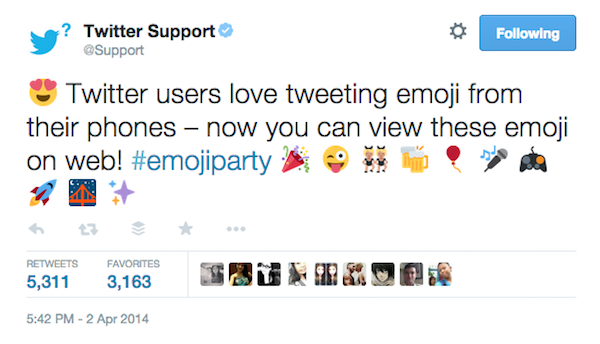 We hope that the permissive licensing of this project will enable the spread of emoji adoption across platforms. To get the #twemojiparty started, we partnered with our friends at Automattic so the WordPress crowd can start using them right away. You can grab the Twitter emojis at Github.